MICHAEL KORS introduces #MKGO Graffiti, the first in a series of limited-edition capsules from Michael Kors. Inspired by 1980’s New York, our new black-and-white graffiti print celebrates street art and its influence on fashion. The limited-edition print puts a graphic spin on jackets, shoes and bags this July. 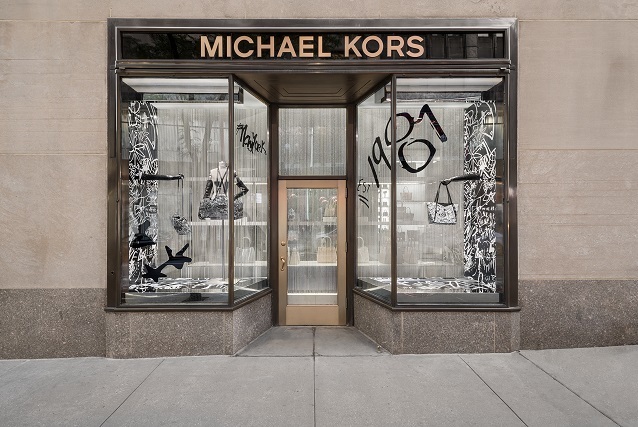 To celebrate the launch, Kors teamed up with style arbiter Candy Pratts Price on a special window display that celebrates designer Michael Kors, his iconic aviators and the new graffiti product. 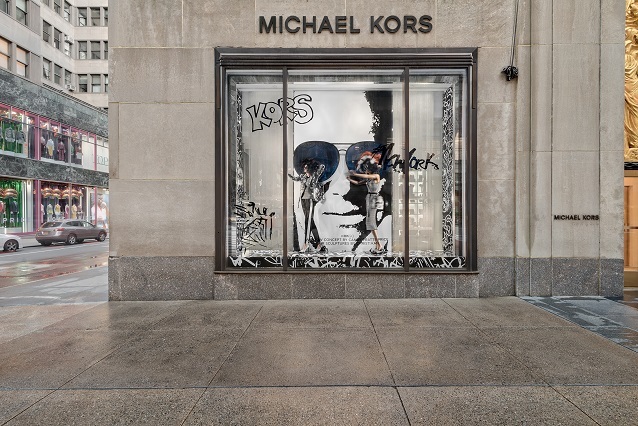 Featuring a floor-to-ceiling screen print of the designer in his aviators, rotating mannequins wear the graffiti product while snapping selfies of themselves in front of the backdrop. In a nod to the no-rules mood of the ‘80s, Pratts Price enlisted renowned hair stylist Christiaan to create the incredible hair sculptures seen on the mannequins. Pratts Price has been a fashion world fixture for over 40 years. Her career started at Charles Jourdan, where she spent 3 years designing the windows before being recruited by Bloomingdale’s president Martin Traub to be the Creative Director of all Bloomingdale’s window displays and storefronts. Since then she has also served as fashion director at Harper’s Bazaar, fashion director of accessories at Vogue, executive fashion director at Style.com, creative director at Vogue.com, and contributing editor at Departures. Christiaan, born in Holland and trained at his father’s barbershop, has been a legend in the fashion world and beyond since the 1960s. He has created some of fashion’s most sought-after haircuts, including Daria Werbowy’s bob and Debbie Harry’s choppy crop, along with numerous hair “sculptures” seen on the covers of Vogue around the world.